Mountain climbing in Rio and making new friends | Surfer Grrrls Brazil! The other day there was literally not a wave in the ocean. So I got a lot of work done on writing and video editing, and decided to spend the afternoon exploring some of Rio’s land-based wonders. 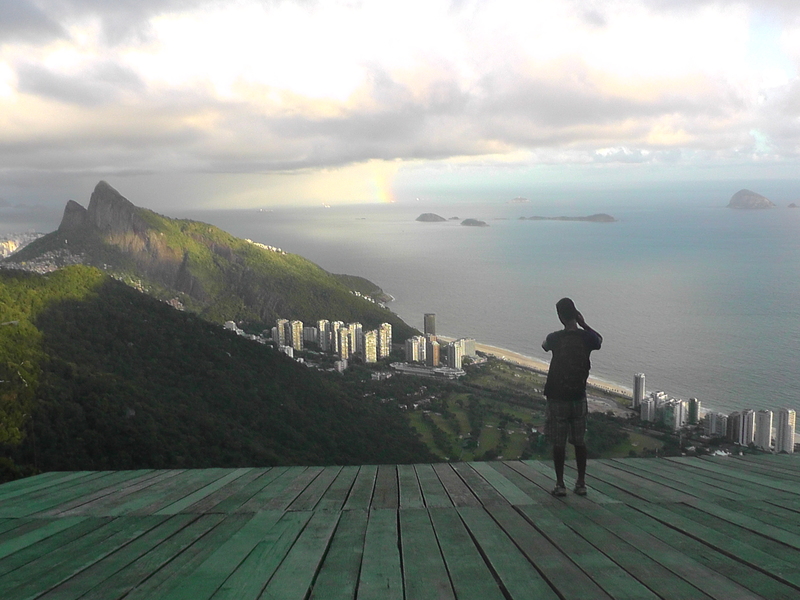 I think one of the reasons I love Rio so much is the strong presence of nature amidst the buzz of the city. The city is sprawled out around towering rock formations covered in jungles. 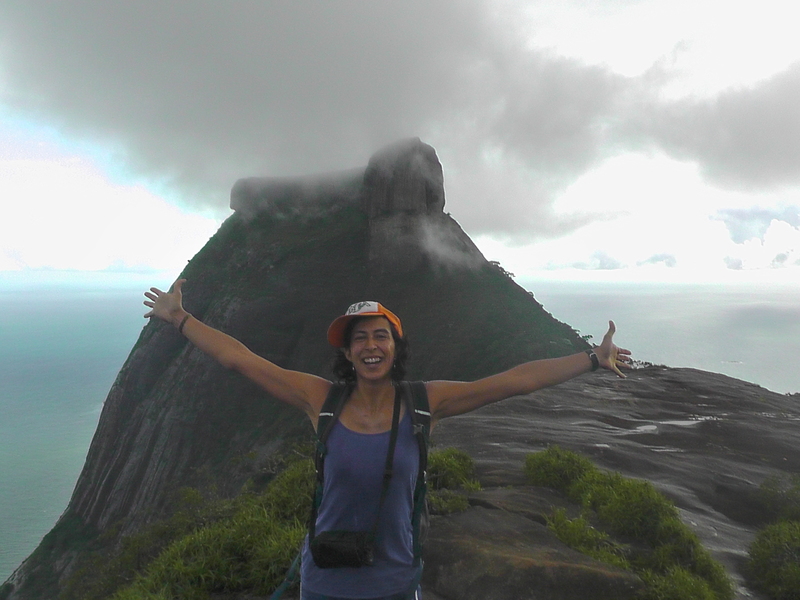 I decided to hike up Pedra da Gávea a huge monolith that stands on the western side of our local beach, São Conrado. Wallace at the edge of the launching pad for the hang gliders who jump off Pedra Bonita and fly down to São Conrado beach. AMAZING! in the right direction. Apparently the hike was not as popular as I had assumed, since the first 5 people had no idea where I should go. Then I finally happened upon a guy coming home from work who was able to give me very detailed directions to the trailhead, but, he warned me, the trail was a bit tricky to follow and had a lot of confusing turnoffs. 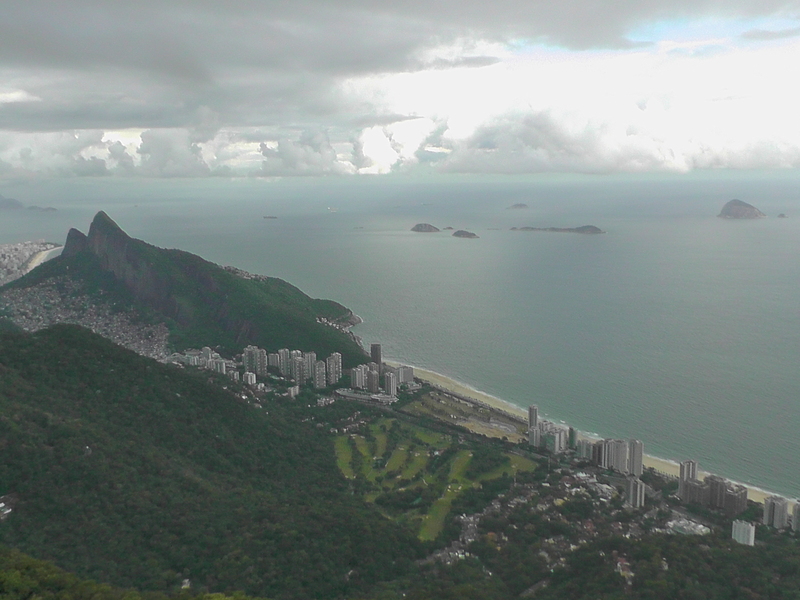 He suggested another hike, up the neighboring, and almost equally tall, Pedra Bonita. The trail was much more straightforward. But, he said, it’s going to be dark very soon, did I really want to do it. I said, I am prepared to run and I flexed my muscles to show him that I was strong and ready! He laughed and said, OK. The view from the top, that’s Rocinha in the crook of the mountains on the left, and that’s São Conrado beach on the right. area and its always nice to have company and Wallace was really cool. I was a little nervous because in the course of our conversation I had discovered that Wallace was one of those uber fit people who does 10 mile super vertical hikes in about 2 hours. I wasn’t sure I was going to be able to keep up, but he took it easy on me, and while I was huffing and puffing, we managed to maintain conversation (in Portuguese!) the whole way up while still making good time, and got amazing views of all of Rio, with all of Rocinha and Sao Conrado below us, and the famous Christ the Redeemer statue in the distance. We made it back down to the bus stop just as the sun set. Another perfect Rio adventure and how cool to be able to share it with a new friend and kindred spirit.